I HAVE never really liked pizza, in spite of what American television claims it represents. I do like cheese, though, in some of its various forms and presentation formats, but I generally would not choose pizza ahead of most other meals available to me. For years, the pizza in Kampala has been presented as special in some way, as if only capable of being produced by persons of a sacred training and anointment, using rare equipment that the ordinary Ugandan would find hard to own, let alone manufacture. When it was brought to my attention, therefore, that a Pizzeria had in recent months opened up across the road from one of the small, ordinary offices I occupy, I was surprised because I hadn’t realised that pizzas had become so easily available in Kampala. I need to stress, at this point, that I am not politically against the pizza as a form of nourishment. I just don’t rate them highly over other forms of food in which I have a culinary and economic interest. So when two weeks ago I was trapped by hunger at a crucial hour of the day and had to place an order at the Pizzeria across the road, I was a bit sceptical. An hour later, I was surprisingly pleased with the experience so much so that I was a repeat customer within the week. I even mentioned this to my children, later that first evening, since they are prone to suggest pizza as an option when we approach dining out in a democratic manner. Luckily for me, our domestic democracy only gives them nomination rights until they have jobs of their own even if they accumulate wealth through savings, so pizzas are not a frequent hazard in my home. Even as I notified them of the new development up my office street, I was mindful that I had not yet made them queue up at any roadside rolex guy’s stand, for obvious reasons – and I was to blame for something there. My office neighbourhood had a couple of roadside Rolex stands whose popularity was disturbing for the distraction they caused when the hunger of their customers overcame their fear of irresponsible drivers speeding up our narrow street. Then last week as I was whizzing past my favourite pork joint, that also serves up a traditional buffet on working days, I was flabbergasted to see that they, too, had opened up a Pizzeria and were advertising it heavily with very specific branding! For a few seconds, my mind linked the rise of Italian food places in my part of Africa to the recent rise in disastrous incidents of African migrants in the Mediterranean Sea near Italy. Sadder still, the Rolex guy on my street is no more, which I coincidentally noticed after ordering the first few slices from the pizza place across the road. Perhaps he didn’t secure the right licensing, or premises, but he sure had the clientele wrapped up from what I saw over the months he was in operation. Thus my guilt, because I have had the opportunity before of branding this product properly and professionalising this food product to rival the Pizza of Italian origin so efficiently that we could have been opening up Rolex joints in Venice rather than Pizzerias in Kampala – but I haven’t grasped it. 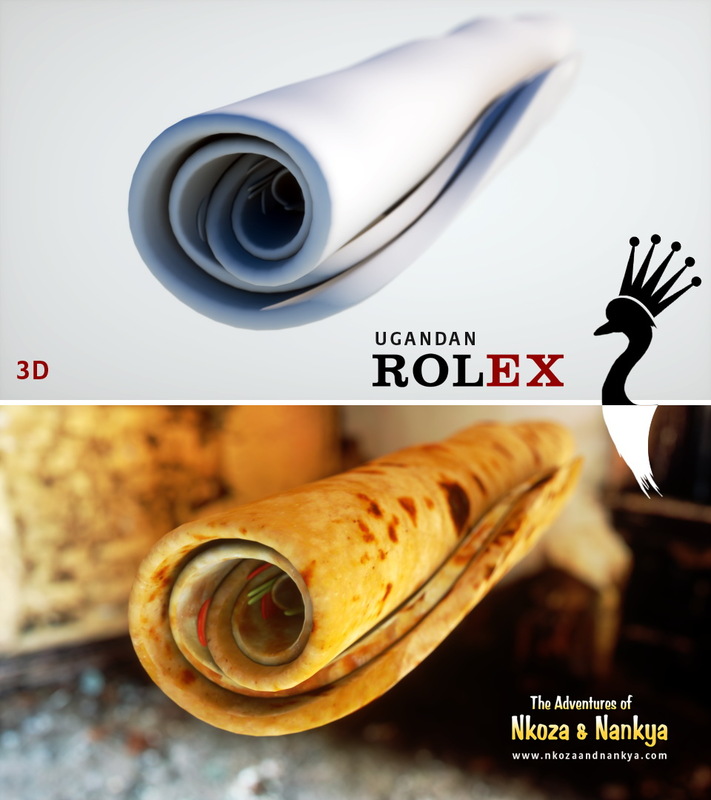 On a related side-note, I suspect that the origin of the Ugandan Rolex as a street food offering dates back to a hungover weekend morning at work when I – yes, me – walked across to the chapati guy near my then-office and bought two eggs from a kiosk nearby to liven up my breakfast meal. I didn’t pay much attention to what I was doing then, and every time I see a Rolex stand I see lost opportunity for myself; but today, every time I see a Pizzeria in Kampala I see an economy heading the way of those Mediterranean migrant boats! Pizzas are even made in ovens apparently imported from some other country, whereas Rolex are made on pans fabricated locally from materials recycled here. Even the ingredients that go into the Pizza are reportedly imported, for some reason! This coming week you guys have an event happening in Kampala called the ‘Kampala Restaurant Week’ – let’s see how many Rolexes are on menus over there, as opposed to Pizzas and other foreign dishes, and then we’ll have a discussion about food, tourism and building local economy. Now that the Pioneer Bus Service is back on the roads of Kampala City, we could hope that a step is being taken in the direction of ridding Uganda of the business of boda-boda as a mode of transport, but that would be displaying naivety. It has taken me a while but I am now finally resigned to the reality that the boda-boda will be part of our lives here for a long time to come, because of our general ‘Boda-Boda Mentality’. You see, even reading this there will be some people arguing that boda-bodas are extremely necessary because without them we would be “incapable” of getting around – especially because of the manner in which our roads and residential areas are laid out. Plus, the arguments will go, if we got rid of boda-bodas there would be an “employment crisis” in this country! 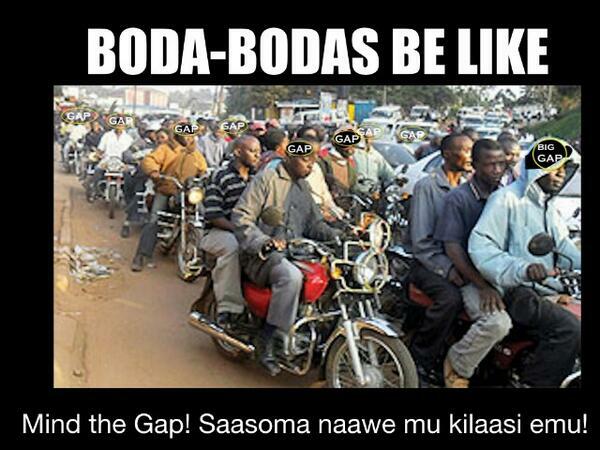 I call that the ‘Boda-Boda Mentality’ because it is a mindset that is characteristic of boda-boda operations themselves. The reasons boda-bodas took over in the first place were: 1. the public transportation system of taxis was disorganised, uncomfortable and so haphazard that you never knew how long a trip would take you if you boarded a taxi to anywhere, since they would jerk to a stop every two seconds or so; 2. Most of our residences are embedded in places that have awkward access roads that make the walk from the house to the nearest ’stage’ uncomfortable, ungainly and downright risky; 3. It’s really the fastest way to get from one point to another without suffering a road rage heart attack due to impatient, mentally disorganised drivers and a traffic management system seemingly managed by people with large amounts of shares in the motor vehicle scrap industry. Boda-bodas were therefore a compromise position that we arrived at to solve the problems above, and THAT itself is ‘Boda-Boda Mentality’ – taking a short term compromise position and allowing it to become a long-term response (not solution) to a major problem, rather than establishing the solution itself. See, the poor taxi system should have been fixed by firmly establishing a proper timed service with designated stages; the lousy access roads to residences fixed by determined urban planning forcing everyone to respect road reserves and drainage systems; and traffic management by being professional at traffic management right from the point of issuing driving permits. But because of a ‘Boda-Boda Mentality’, we can’t even invest sensibly in transport such as a bus system that runs on time and stops at pre-designated points in 2015, even though a country like Hungary built its underground train system in 1896. For instance you and I, educated, well-heeled, knowledgeable elites though we may be, see an ‘opportunity’ in buying a boda-boda and monitoring proceeds from it over a six-month period till the ‘investment’ has ‘paid off’ and even given us ‘profits’ – even if they collectively account for the bulk of hospital admission cases due to accidents. Whereas THAT is an investment opportunity by the very definition of the words, it is only so because of our ‘Boda-Boda Mentality’, otherwise we would have identified the bigger opportunity in pooling our money together to invest in an urban train or bus service. In fact, were it not for the ‘Boda-Boda Mentality’, the educated elite of this country would have identified opportunities in the boda-boda transport industry such as helmets made in Uganda, or more comfortable boda-boda seats designed in Uganda out of Ugandan materials, and maybe even reflective aprons made out of local materials. But none of the tens of thousands of economists, engineers, designers and what not that we have churned out of universities in Kampala and elsewhere since 1922 have gotten to this point yet. Boda-bodas even provide an opportunity for spare parts manufacturing if somebody stops to count the number of side mirrors they destroy when they whizz past our cars in our gridlocked traffic (do a snap survey and see for yourself the gravity of this particular problem). They tend to take shortcuts even going down the wrong side of the road into oncoming traffic – the same way many of us approach business, taking those short cuts that put everything at unnecessary risk, like condoning corruption, but for short-term gain and getting to the other end having left behind us hundreds of people jeering and cursing at us. They don’t bother with helmets even when they have them, and ride with them placed on the handlebars – the way we don’t do the ordinarily necessary and sensible things available to us, like insurance, preventive medicine, or even having smoke detectors or fire extinguishers in our own homes! In fact, many believe that no rules apply to them, and will gather in a mob to deal with anyone who even shouts an insult at one of their kind – exactly like some people do on social media platforms should you say anything they don’t agree with. And until we see boda-boda riders graduating to buses with designated stages running on timed schedules, we are all just boda-boda riders masquerading as serious people. whoever killed captain alex did Uganda a major favour! ABOUT five years ago the trailer for the movie ‘Who Killed Captain Alex’ was posted to YouTube.com. Many of us suffered physical injuries caused by laughing when we were first introduced to that two minute trailer, and we sought out the full movie with both caution and relish, but zero success – until about a month ago when it was actually ‘released’. From there on, the viewer is subjected to over one hour’s footage of ludicrously comedic proportions in terms of presentation, plot, production, and everything possible and impossible on screen. Many of us watched the trailer on its own and never got round to catching the full movie, and many more dismissed it as inferior to the quality that they are accustomed to, from Hollywood and such other lofty heights. But this week the man behind ‘Who Killed Captain Alex?’ has made it to the mainstream global news and given Uganda positive media coverage while the rest of the region is engulfed in floods right in the middle of their cities, and coup d’etats. It turns out that after that first trailer was released back in 2010, a young fellow in the United States, in New York, spotted it and within forty seconds of viewing had made the decision to come to Uganda. The American, Alan ‘Ssali’ Hofmanis, didn’t even call the number at the end of the trailer – 0712921775 – or do a background check on this ‘Ramon Productions’. He processed himself, bought a ticket and came straight on down to Uganda, and then somehow made his way to Wakaliga, the village where Isaac Nabwana (I interchangeably call him Nabwana and Nabwaana because one is more likely the accurate one and the other has been assumed) lives and shoots his movies. Yes – movies! Nabwaana didn’t stop at ‘Who Killed Captain Alex?’; he has also produced or shot trailers for ‘Tebaatusasula’, ‘Return of Uncle Benon’, ‘Bad Black’ and ‘Rescue Team’, among others! Ergo the term ‘Wakaliwood’ – a merger between Wakaliga and Hollywood (visit http://watch.wakaliwood.com/ for the high profile version). The number of YouTube views the young man has garnered are in the millions, and should be immediately taken up by the Uganda Tourism Board, the Uganda Investment Authority and any commercial entity in Uganda that is interested in international exposure. Seriously! Those are millions of eyes of people whose cognitive association with Uganda is happily full of mirth – not Idi Amin, Ebola, Politics or any of the usual stupidity! Plus, the comments of the viewers tell you everything there is to know about the power of creating content and posting it onto the internet. The fact that Hofmanis needed only forty seconds of film to make the decision to leave the United States for a life in Uganda is proof that we can move millions of people’s dollars, euros, pounds, yuan, yen and even Zim dollars if we create the right content and use it wisely on the internet. You see, platforms such as YouTube are incredible tools for countries like Uganda if we learn how to harness them properly. This week Uganda also won the award for Best African Exhibitor 2015 at the Indaba Tourism Fair in South Africa, thanks to the hard work of our Tourism sector and the people at the helm there. That stand cost us lots of sweat, money and additional hard work doing sales and marketing, and was probably visited by thousands of people whose primary function in life is directing monied tourists to the countries they should spend their time and money in. It was VERY important. But consider that with about US$200 per film, Isaac Nabwaana and Wakaliwood has the potential on YouTube of reaching 1,000,000,000 (one billion) users, and that every day people watch hundreds of millions of hours on YouTube. This website is localised in 75 countries and is available in 61 languages – so films like ‘Who Killed Captain Alex?’ with its amateur but extremely funny expressive comedy, could be replicated 61 times if our Department of Languages put some work into it – probably getting us 61,000,000 views in the process! If just one percent of each view got us one visitor here within forty seconds the way Hofmanis was snared (or forty minutes), that would be … US$30million in visa fees alone at US$50 per visa payable at Entebbe Airport! US$30million revenue to the Republic of Uganda from the selfless creative efforts of an uncelebrated slum-dweller called Isaac Nabwaana of Wakaliga who never features in any of our celebrity pages and never gets mentioned on Twitter and Facebook and certainly won’t be on any of our national medal lists any time soon…except mine, now, because this young man has definitely made my week as a proud Ugandan! If you are online and savvy enough to join the crowdsourcing initiative, you could visit their Kickstarter page and throw in your offering. If you are in Uganda and can’t be bothered to do such things as transfer money online, perhaps you will visit that page and see how Nabwaana and company have converted bits of old vehicles into film-making equipment. If you do make that observation, and have a couple of old hard drives, computers, and other stuff that could be useful to a film-maker, donate it to Nabwaana and team. I haven’t asked for their permission to say this, but I am sure the clothes they wear as props come from some wardrobe somewhere that could do with replenishing with whatever the rest of us can come up with. Unlike many other people of self-importance, the man even has his own documentary selling on Amazon! See here: http://www.amazon.com/Wakaliwood-Nabwana-I-G-G/dp/B00F4CNEXE – putting Uganda on the map for much better reasons than fraud, theft, embezzlement, wars and what not! I just wish I could translate this into the commentary language that the Wakaliwood guys use in their movies – complete with a translation of the volleys of bullets (“Wololololo!”); and THAT’S another thing Nabwaana and company are doing for us – putting us out there for that innovative translation of movies into our local vernacular. Nabwaana is a good Ugandan! EVERY so often one falls upon a random story that carries no excitement until one exercises the brain a little bit. This week it’s about ‘Fred’s Bicycles’, which has further delayed my treatise on the boda-boda mentality that plagues my people and I.
I have issues with the “giving back” part of the story because it fits comfortably into the lazy narrative that Europeans have of countries like Uganda, but we will talk about that later in life. More importantly, this story underscored to me once again the importance of a good education, rather than the instructive one-plus-one-equals-two type of schooling many of us got. This is not to say that all British young men who visit Uganda are well educated enough to do what Davenport and Coppel did, but the fact that they came over here and identified opportunity out of an item that we actually despise as a sign of poverty and backwardness, means they are well educated. The two young men also reminded me how much we have around us that we take for granted and yet could be very highly valued elsewhere (Their bikes go for £249 each – about Ushs1.1million each). The bicycles they talk about were not even designed or made in Uganda; from the photos on the website, these are what we used to call Hero bicycles, which eventually gave way to Roadmaster Cycles. One other website containing a research paper by United States university Professor Jason A. Morris, even states that the Hero Bicycle was “originally built in 1913 for the British military, and it has not changed since”. This researcher came all the way from the US to Hoima to design a bicycle for Ugandan use to replace the Hero and Roadmaster bicycles. His efforts are available in that research paper but I, personally, know nothing of the results being on the road. Instead, I know Roadmaster Cycles started assembling bicycles here at some point at a US$6million facility (press reports say) in Nalukolongo in 1993, after seeing the opportunity in a populace that had poor roads then, lots of agricultural activity, and incomes too limited to fund car manufacturing or even assembly. Surprisingly, to me, their website displays a wide range of products including bicycles for children! And yet, somehow, most monied people are riding mostly second hand bicycles coming in from the same England that Davenport and Coppel are selling their bikes, inspired by Uganda, or bicycles imported from South Africa and further afield. What about the realisation that on the day I fell upon this story of Uganda’s inspiration, I saw three stories in one newspaper talking about sums of money being earned by Ugandans -Ushs100billion, Ushs15billion and Ushs400million – yet none of these will ever be converted into bicycle manufacture, assembly or anything similar anywhere in the country. Wait! Wait! 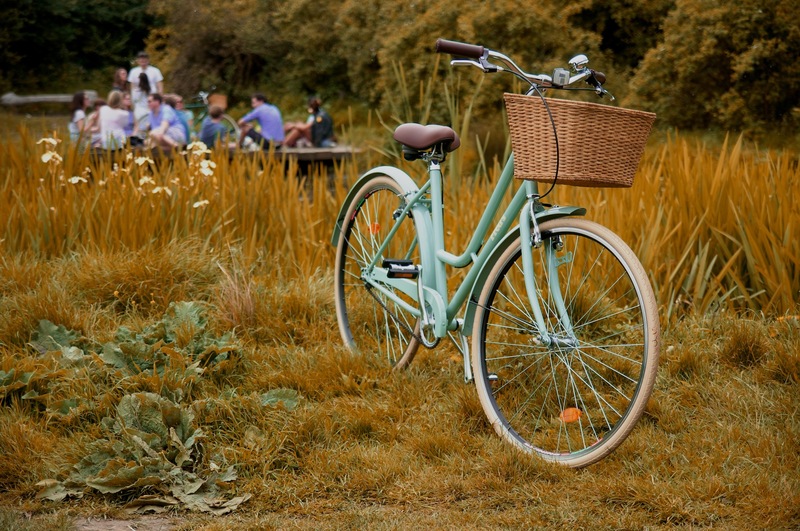 What is the most notable bicycle story YOU can think of…? Yes! The one in which Permanent Secretary John Kashaka was convicted over the sham importation of bicycles worth Ushs4billion, right? 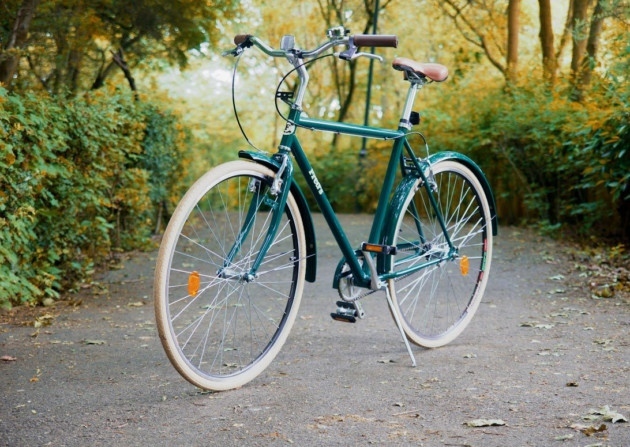 You would probably have been less confused about it if the 70,000 bicycles in question there had been ordered direct from the Roadmaster Assembly Plant in Nalukolongo, wouldn’t you? But according to the Public Procurement and Disposal Authority (PPDA) Investigation Report into the matter, Roadmaster was not even one of the bidders that successfully submitted bids – which list included names such as “Nile Fishing Company Limited and Shinyanga Emporium”. I swear – go to this link for the full report and see for yourself! Yet, in March 2011, Roadmaster Cycles appeared in press reports alongside John Kashaka as he officiated at the distribution of 5,200 bicycles to Parish Chiefs (LCs). The bicycles, read the report, were worth Ushs669million (each just over Ushs128,000 – about a tenth of the cost of Fred’s Bicycles…) – and were distributed at the Roadmaster premises. Practice saying that and see how easy it is. And the response is simple: “Yes…(followed by the other paragraph above). I joined this group long ago and have a large array of Uganda shirts with me whenever I travel, but even take it a notch higher sometimes. 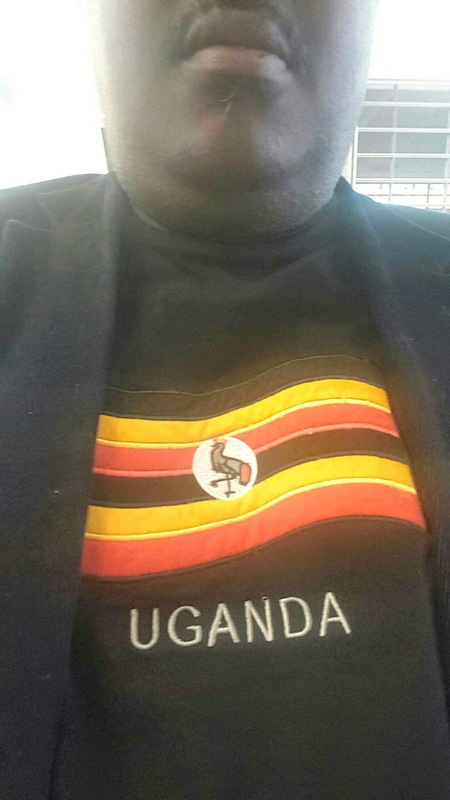 At an airport in Los Angeles a few weeks ago, I realised that the cafe my group and I were seated at was quite crowded and jumped up with my Uganda t-shirt on full display (body girth helps), then kicked off. Rather than just walking around and hoping someone would ask a question, I contrived to take a phone call from someone asking me about the best place to visit on holiday. The reaction was positive; at first I might have been mildly irritating, but being a good performer I threw in some interesting gestures and a couple of dance moves (it’s easy to not be shy in foreign lands). Before long I had their attention and sold Uganda enough to get a couple of thumbs-ups, smiles and nods as I returned to my seat. By the time that conversation ended, the person asking would be set right about Uganda (see the other paragraph above). And right now, I am toying with the idea of designing a tee-shirt with that paragraph above boldly printed on the front, especially because someone my size could certainly pull it off!